A mockup of NASA's Curiosity Mars rover gets its wheels dirty in sand dunes near California's Death Valley in early May 2012. NASA's newest Mars rover won't touch down on the Red Planet until August, but scientists are already testing out the vehicle's desert driving skills. Last week, researchers took a test version of NASA's Curiosity rover out to Dumont Dunes in California's Mojave Desert, near Death Valley. The goal was to learn more about how to operate Curiosity after it touches down at Mars' Gale Crater on the night of Aug. 5, researchers said. The test rover is called "Scarecrow" because it doesn't have an onboard computer "brain" like Curiosity does — an apparent reference to the movie "The Wizard of Oz," in which Dorothy's friend Scarecrow asks the all-powerful Wizard for a brain. 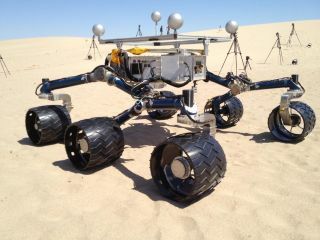 The Scarecrow rover does have a full-scale version of Curiosity's mobility system, NASA officials said. But aside from that, the rover is stripped down so that it weighs roughly 750 pounds (340 kilograms) — about as much as Curiosity will weigh in the lesser gravity of Mars. (Here on Earth, Curiosity tips the scales at nearly 2,000 pounds (907 kg). For the desert test drive, scientists sent Scarecrow crawling across the dunes to better prepare for Curiosity's journey, which will likely feature some dune driving in and around Gale Crater. Curiosity is the centerpiece of NASA's $2.5 billion Mars Science Laboratory mission. The rover's main goal is to determine if the Gale Crater area is, or ever was, capable of supporting microbial life. Curiosity has 10 different science instruments to help it address this question, including a rock-zapping laser and gear designed to detect organic molecules — the carbon-containing building blocks of life as we know it. The rover will study the many layers of Mount Sharp, the mysterious 3-mile-high (5-kilometer) mountain rising from the center of Gale Crater. This artist's concept depicts a sky crane lowering NASA's Curiosity rover onto the Martian surface. Before the rover can begin its science operations, of course, it must land safely. Landing on another planet is always a tricky thing to do, and Curiosity's touchdown is likely to be more anxiety-inducing than most. Because Curiosity is so heavy, the rover team had to devise a new way to get it onto the Martian surface safely. They decided to use a rocket-powered sky crane, which will lower the robot on cables and then crash-land on purpose a safe distance away. The Curiosity rover will be NASA's fourth, and largest, rover ever to land on Mars when it arrives in August.